The upper is the combination of fabrics that form the top-most part of the shoe. Fabric properties such as breathability, durability and water resistance vary depending on the shoe’s purpose (i.e. racing, trail running etc). The different parts of the upper may be stitched together or heat bonded with glue to create a seam-free fit. Premium fabrics, such as adidas’ Primeknit and Nike’s Flyknit, are used to make ‘one-piece’ uppers, eliminating seams. These uppers are constructed using different weave patterns to provide highly adaptive fit. Overlays are durable pieces of material that are attached to the upper to provide shape and structure to the shoe. They are also used to provide an element of stability for the foot. The number of overlays, as well as where they are placed, can affect how snug a shoe feels to the wearer. Overlays can be attached to the upper either by stitching, heat bonding and even 3D printed directly onto the fabric. As well as housing the shoe’s lacing system, the lace cage can provide different levels of torsion to the shoe. The materials the lace cage is made of, as well as its placement on the shoe, can vary to suite the intended use of the shoe. The lace cage can be stitched flat against the upper, or a partially attached layer that adapts with the foot’s movement to feel more flexible. Two examples of a ‘floating’ lace cage can be seen on the adidas Ultra Boost and the Saucony ISO-Fit series. The tongue sits under the lacing system and provides an element of integrity to the shoe when the lace is tied. Its thickness depends on the shoe type. 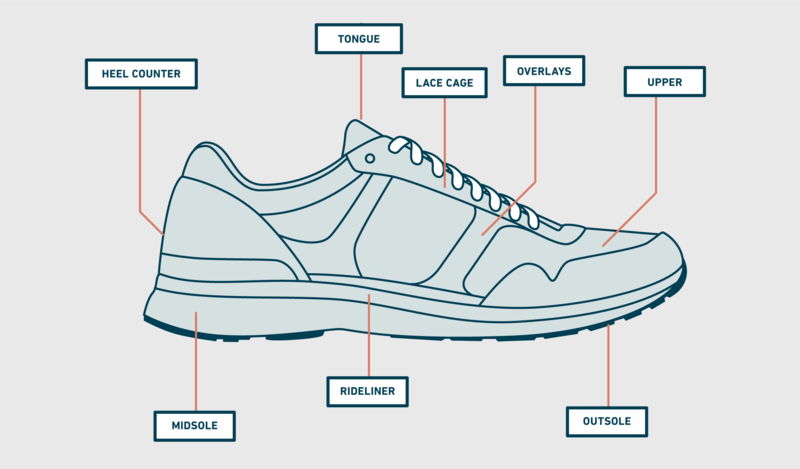 Lighter racing shoes tend to have a thinner tongue, made out of a lightweight material. Shoes with more cushioning more cushioning may have a thick, padded tongue. This provides an all-round feeling of cushioning and comfort. Some trail shoes feature a wide tongue that is stitched to form a protective layer between your foot and any debris that might find its way into your shoe. The heel counter is a moulding placed at the back of the shoe to secure your foot. Heel counters can be made of plastic or fabric. Some are attached to the outside of the shoe where it is visible while others are enclosed in the upper. Some brands include some support for your Achilles in the heel counter where as others sit them lower to prevent rubbing. Which you opt for is a matter of personal comfort. Depending on the brand, the sockliner may reference either the fabric used to cover the insole and the inside of the upper, or the insole itself. Most running shoe insoles can be removed and replaced with prescriptive options, where one has been prescribed and fitted by a medical professional such as podiatrist. Premium sockliners have additional benefits such as odor control. The midsole is the mainstay of the shoe’s cushioning system, typically made of an EVA (Ethylene-Vinyl Acetate) foam combined with a brand’s proprietary cushioning technology (Saucony’s EVERUN, Brooks’ DNA, Mizuno’s Wave). The notable exception is adidas Boost which is made from thousands of tiny foam pellets fused together to make a more durable and energy returning midsole. A lavish piece of technology not found in all running shoes, the ride liner lies between the midsole cushioning and the foot. Its purpose is to provide an additional element in cushioning and comfort. The medial post is the stabilising mechanism found in support and motion control shoes. Most commonly, the medial post would be a blend of two materials with different densities, one firmer than the other. The firmer acts as a break during the runner’s stride, slowing down the rate of pronation where there is excessive movement in the foot. You can often spot dual density technology as the firmer material is a different colour or a contrasting pattern to the softer material. The adidas Ultra Boost ST is an exception here again. The stability element is delivered by using a higher density of Boost pellets in the medial part of the shoe. The stable feature is called out on the shoe using a coloured piece of plastic, which is purely aesthetic. The last signifies the shape of the foot model that the shoe was constructed around. There are three different types of last; curved, semi-curved and straight. The straight last is more often used to build walking shoes and not very common in running shoes. The size of the last used by a brand will also dictate the width of the shoe. 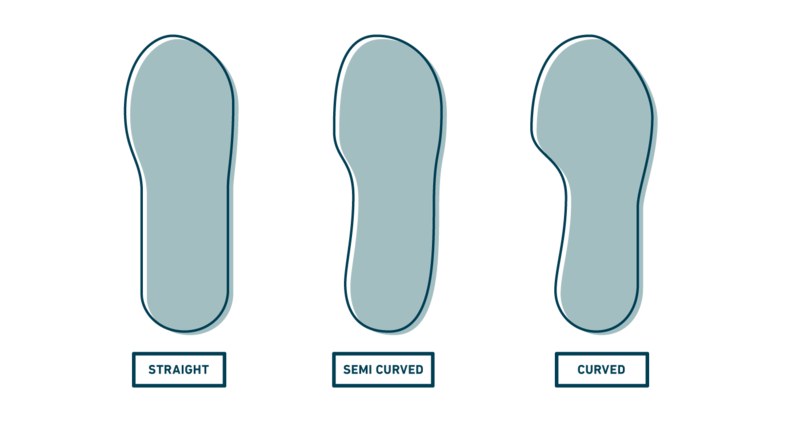 The outsole is the very bottom layer of shoe that provides the necessary traction (grip). It is made from a blend of durable compounds, usually carbon rubber, bonded together. More robust materials are placed in the most typical areas of high wear, such as the heel. Off-road shoes feature prominent pieces of rubber, called lugs, that have qualities to suit different types of terrain. Longer, more aggressive lugs will perform well on muddy surfaces. Lugs with sticky rubber will be helpful on rocky / stony terrain. The heel / toe drop describes the gradient of the shoe, measuring between the height of the heel and the height of ball of the foot. For example, if both the heel and the ball of the foot sit 10mm off the ground there is no difference between them and the drop would be 0. However if the heel is 27mm from the ground and the toe 19mm, the heel / toe drop would be 8mm.